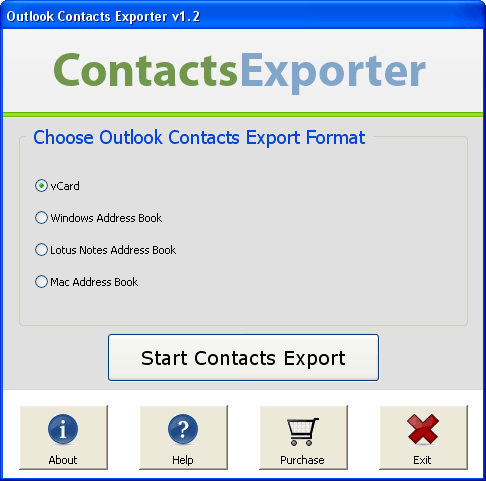 Outlook Contacts Exporter 1.6 - Download Win Apps. Convert Outlook Contacts to vCard, Lotus Notes, Mac & Windows Address Book. Try Outlook Contacts conversion utility to export Outlook contacts to lotus notes, mac address book, outlook express address book, vcard. Software easily move & transfers Outlook contacts PST of Outlook 98/XP/2000/2002/2003/2007. Get Outlook contacts exporter program to perform Outlook contacts to lotus notes conversion, outlook contacts to vcard conversion, outlook contacts to mac address book conversion, outlook contacts to WAB conversion. Use it to convert Outlook contacts to vcard, mac address book, windows address book, lotus notes contacts. it reads contacts of Outlook PST file and quickly performs Outlook Contacts conversion.